The ClogChopper™ from General Pipe Cleaners is a powerful drain cleaner that cuts through debris without damaging pipes. Unlike snakes or drain cleaning tool heads that go around tough clogs, the ClogChopper cuts right through them. Clogs caused by roots, scale, and crystallized urine are easily ground up and released by using this tool. The ClogChopper™ can safely be used in metal, plastic, & clay pipes. The ClogChopper has a spherical head with six self-sharpening blades that cut through a large variety of substances that clog a drain. As the snake spins, the blades work together to slice through blockages and safely scrape the walls of pipes to remove built up substances. One of the best features of the tool is that it is specifically designed to safely maneuver around bends and traps while maintaining a central line position. Maintaining that central line position greatly reduces the chance of damaging pipe walls, elbows, connections, and joints. The tool’s “all surface” cutting blades not only clear major blockages, but they also scrape the debris that is coated on the walls of the pipe. This helps stop more debris from collecting and causing another clogged pipe down the line. The tool connects to the head of General Pipe and Ridgid drain cleaning machines. When in use, the tool glides smoothly through the pipe without rattling or jumping. It filters all debris into and out of the tool in one smooth operation. It attaches to the coupling of the snake, and works on everything from handheld snake tools to mini-rooters and maxi-rooters. The combination of the ClogChopper’s cutting power, smooth maneuverability, and safe wall scraping feature make this a much more effective tool than augers, spiral saws, spade cutters, or similar instruments. Rip Through Tough Stoppages with Ease! This drain cleaning tool can safely be used in downspouts and mains, for drain lining jobs, and clearing stacks. General Pipe Cleaners manufacturers high-quality drain cleaning products and tools. All General Pipe Cleaner products are manufactured in the United States. Equiparts has a strong relationship with General Pipe Cleaners. We have been a distributor of their drain equipment for over 40 years. According to the manufacturer, since parts like cutters are subject to severe wear, they will be replaced or repaired only if a flaw in the material causes the breakage, and if it’s within a year since the purchase. View, save, or share the Clog Chopper PDF with your colleagues. This new Drain Cleaning Tool by Tornado unclogs drains quickly and easily with a new patent pending design that is more efficient than other drain cleaning tools. It’s length makes it reach further into the pipe – through S and P traps to the problem area. Its single side barb and spearhead design helps it move through the pipe smoothly, and rotate through any resistance while simultaneously grabbing onto any hair or debris stuck in the drain. Environmentally safe with no chemicals required. To order, call us toll-free at 800-442-6622 Monday-Friday, 7:30AM-5:00PM or submit a quote through the 26″ Flexible Hand Held Drain Cleaning Tool on our website. 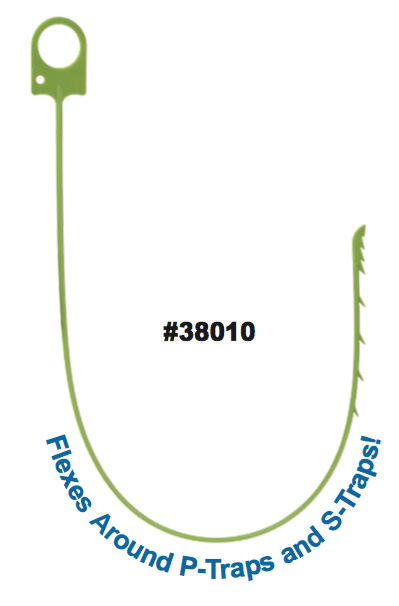 You can also share or download our 38010 Flexible Drain Cleaning Tool PDF.